Our goal is to ensure a pleasurable ride to all our visitors. In order to achieve this, we give you notice of all our policies and restrictions. The rider’s weight limit is 250 lb. It is non-negotiable. In the online booking form, and at the registry you will be asked to submit the weight of each participant; this in order to match an appropriate horse to each rider. In the case that our staff members at Bonanza considers that any participant does not comply with the weight policy above. In such case, in order to protect the rider’s privacy, he/she will be weighted in a private and confidential setting. Many persons do not like to recognize the importance of weight in horse safety – for both themselves and the horse. A rider who is overweight cannot perform as well because he puts more stress on the horse’s muscles. In the case that he falls, an injury is more likely to happen because the greater weight puts more stress on the same bones. Imposing a weight restriction on riders is not a matter of prejudice against heavy persons. It's a matter of safety for both horses and riders. Every pound that is added to a horse puts strain on a horse's back. Too much weight can cause rub-sores from the saddle, strained muscles, and pinching of nerves. Permanent damage such as a "sway back" or deteriorated muscle function can even occur over time. A horse that is child-safe, bomb-proof and completely docile under normal conditions may become agitated, frustrated, fatigued, irritable and even unpredictable when over-stressed by a heavy rider. The conformation, condition, and soundness of the individual horse are all very important factors: two horses of identical height and weight might have vastly different builds and weight-carrying abilities. Short, strong, and sturdy horses typically have greater weight-carrying ability than tall, narrow, lightly-built horses, but you need to look at each horse individually. Rider skill plays an important part. See the diagram below as an example of this effect. Terrain is another factor –a horse that could carry a heavy rider around a flat field with good footing, at a walk, might find it impossible to carry the same rider up and down hills. Gait is yet another factor –a horse that could carry a heavy rider around a flat field with good footing at a walk might find it difficult or impossible to carry that same rider in the same flat field at a trot or canter. Tack matters, too After all, it is the interface between the horse and rider. Saddles need to fit both the horse and the rider. If the saddle fits the horse perfectly, a rider for whom the saddle is too large will be unlikely to cause the horse any pain or damage, but a rider for whom the saddle is too SMALL will cause both pain, and in a very short time. 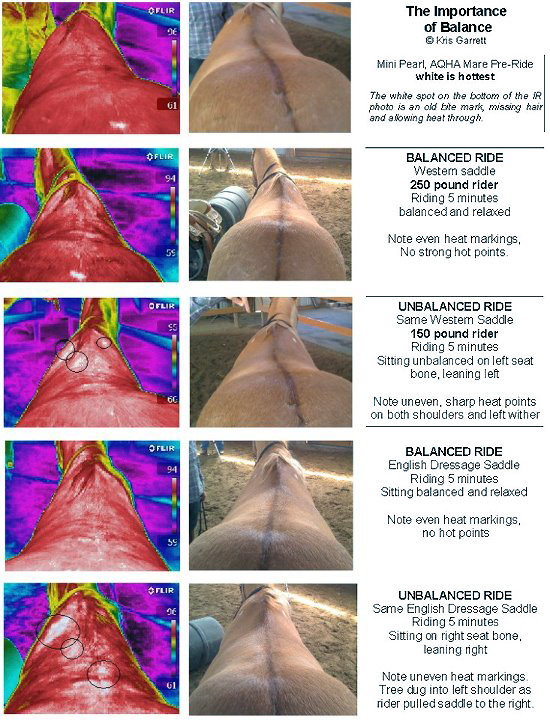 A saddle can fit a horse well, causing it no pain or injury, until it is sat in (or upon) by a too-heavy and too-large rider; at that point, the rider's weight will be in the wrong area of the saddle, and will be causing portions of the saddle to create severe, physically damaging pressure on delicate areas of the horse's back.